Michael saw a recipe in the Washington Post about twenty years ago that inspired him to make this. It’s a very healthy, low-fat, vegetarian chili. 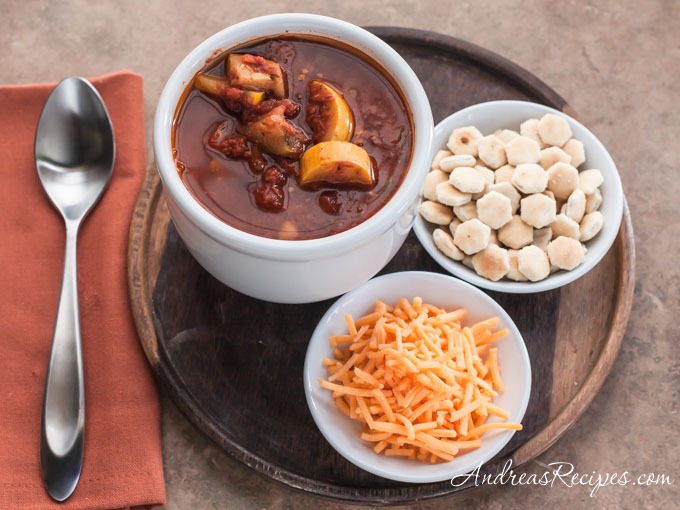 He likes it chunky, and true chili mongers might even call this a soup done up tex-mex style. When Michael makes it for himself, he uses lots of hot peppers. In fact, he likes to sweat when he’s eating chili. After we started dating, he asked me if I liked spicy foods and I said yes. Of course I did not realize that our ideas of spicy were nowhere close to each other. I like lots of flavor, he likes heat. So the first time he made this chili for me, he turned up the heat. My eyes were watering and my mouth was on fire, and I drank water and ate crackers for about an hour trying to kill the burn. He’s making the chili very mild for me since I’m pregnant with #3, then he adds some hot pepper sauce to his bowl. You can make this quickly in about 45 minutes if you are in a hurry, but it’s better when it has time to simmer for a couple hours. Serve with grated sharp cheddar and crackers or jalapeño corn bread. Add olive oil to pot over medium-high heat. Add the onions, peppers, and garlic and cook until they start to turn golden. Add the basil, oregano, cumin, cinnamon, chili powder, dill, and salt. Stir and continue to cook until the spices are very fragrant, about 5 minutes. Add the yellow and zucchini squash and saute until tender. You can add another tablespoon or two of olive oil as necessary. Add the tomatoes and beans. Fill the can of crushed tomatoes with water and add it to the pot. Cover and cook over medium heat for 10 minutes. Reduce heat to low and cook for at least 30 minutes. The flavors develop the longer it cooks. Taste and adjust seasonings as necessary. If tomatoes are out of season, you can use canned whole peeled tomatoes instead. Frozen squash works well in the winter months when they are out of season. You can substitute whatever peppers you have on hand. Go for some color. If you like spicy foods, go for the gusto. Add a habanero or two. If you prefer a milder version, lower the spices and garlic. This can also be cooked in a large slow cooker. After Step 2 dump everything in the slow cooker and cook on high for 5 or 6 hours or low for 7 to 8 hours. I made this in the crockpot and you weren’t kidding – it was hot! I only used 1 jalapeno, no serranos or anaheims. This may be obvious to some, but with the herbs (basil, oregano) does that mean 2 tablespoons fresh or dried? This chili had a lot of flavor and I would make it again, but I would cut back on all of the seasonings. I guess I would like it milder like you suggested. Hi Shannon. Michael uses dried, so I modified the ingredients list to reflect that. What a great idea!! Looks like a great chili recipe. I am going to have to try this one this weekend. I am going to cook it for the family.